Datura is a woody stemmed herbaceous plant in the family Solanaceae; it is extremely poisonous. The plant is commonly called Angels Trumpet, due to the shape of the flowers. It boasts large, narrow bell-shaped flowers and lusterless leaves. The plant is sold under the name Brugmansia in modern nurseries. The name Brugsmansia comes from a Dutch professor of natural history, Sebald Justin Brugmans. The generic name, Datura, stems from the Arabic name for the plant, Dhatura. The history of the plant stretches back centuries and early Sanskrit writings mention its attributes. Virgil and Shakespeare wrote about it and in 301 BC a student of Aristotle warned against its poison. As early as 5th century BC, the herb was linked to Buddhism and has a large cultural significance in East Indian ritual and spiritual life. Brugmansia is found in warm to temperate zones with approximately 25 species commonly grown. The datura is found under many names, including among them: Jamestown weed, jimson weed, stinkweed, Angels Trumpets, thorn apple, apple of Peru and sacred datura. The toxicity of the plant lends the name devil's weed and the nightshade type habit of closing its flowers in the evening gave it the name moon flower. The datura plant contains the alkaloids scopolamine and atropine. These contribute to the plant's toxicity which can poison those who ingest it and lead to death. It is also a powerful hallucinogen; in modern times poisonings have occurred in those who have attempted to harness that property. The poison can cause paralysis of the eye and lead to temporary blindness, confusion, dry mouth, skin sensitivity and violent hallucinations. Immediate emergency care should be sought in cases of accidental ingestion. 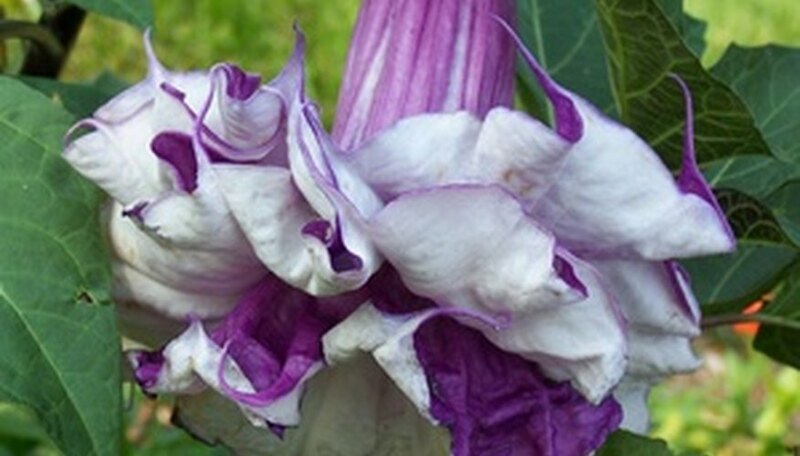 The datura plant has been used by Native American in rites of passage ceremonies. It has a spiritual history in India where it was used in the study of the Vajramahabhairava-Tantra, a tantric text detailing worship and healing uses. It has also been implicated in use for murder and East Indian women used to feed the leaves to beetles and then feed the beetle excrement to their unfaithful husbands to kill them. In early colonial times the thorn apple was considered an aid to witches and anyone caught growing was accused of witchcraft. Datura is related to the nightshades and as such thrives in hot areas. Soak the seeds in warm water for 24 hours prior to planting. Germinate by folding into a damp paper towel in a plastic baggie that will be stored somewhere warm. Once roots have sprouted, carefully plant it in 2-inch pots. Let the seedling grow for approximately eight weeks. Fertilize weekly with diluted fish fertilizer. Once the danger of frost is gone, plant in a sunny location with humus rich soil. The datura plant can also do well in containers, but staking may be required for the larger species. Florida Department of Agriculture and Consumer Services: Datura spp.